We the people of Union Institute & University are celebrating Constitution Day 2017! September 17, 2017 will mark the 229th anniversary of our nation’s founding document. 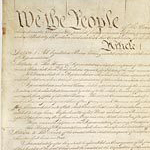 It was signed September 17, 1787 at the Philadelphia Convention by 39 delegates. Who are our Founding Fathers? Click below to learn how a degree from Union can fulfill your dreams!